HOUSTON (Reuters) - Houston officials and environmental groups raced to expand air monitoring after a raging fire at a Mitsui & Co petrochemical storage site spread on Tuesday, billowing acrid smoke that could be seen and smelled miles away. 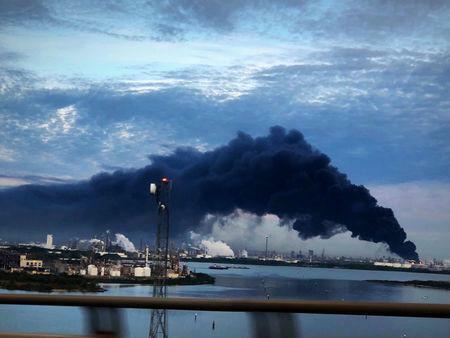 The blaze at Mitsui unit Intercontinental Terminals Co in Deer Park, Texas, has ignited or consumed 12 of 15 tanks at the site, officials said in a late Tuesday briefing. It would be another day before firefighters would know if the inferno could be contained, said an official with an energy industry group helping battle the fire. The fire began on Sunday when a leaking tank containing volatile naphtha, a fuel used in the production of gasoline, ignited and flames quickly spread to nearby tanks, ITC said. The tanks each hold up to 80,000 barrels, or 3.3 million gallons, of volatile liquid fuels, making the fire difficult to extinguish. Just as the company has struggled to contain the blaze, it has changed its explanation for the fire's spread and the number of tanks involved. On Monday, it said 8 tanks were burning then revised the figure to seven. Tuesday morning it blamed a failure of two water pumps for the fire's expansion to more tanks, and by the afternoon said there were no pump failures. A local fire official said the blaze may have to burn itself out. "I can't tell you how long it will take to burn out," said Harris County Fire Marshal Laurie Christensen at a morning briefing. "I'm not going to give you a timetable." On Tuesday, ITC added a 15-person crew experienced in battling tank-farm fires as well as additional high-pressure pumps and suppressant foam. "We have been up to this point in defensive mode" trying to contain the fire, said Samuelsen. "Because of the expertise these guys bring, the expectation is we'll be able to go into offensive mode."